Here is a little information about my background. Hi. My name is Michelle Hunting. Let me take this opportunity to tell you a little bit about myself. Here's alittle background info. As a child and teenager, I was active in all aspects of 4-H and pony club. 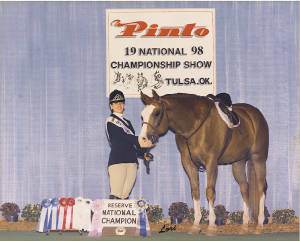 In 1989 I was introduced to the wonderful world of pintos, and my parents bought me my first pinto pony Captains Pride. Within a couple of years, it was time to move onto a horse. I began showing Gypsys Django Swing in the early 1990's. We competed successfully in all the youth events, earning my PtHA champoionship, several PtHA ROM's,quite a few NEPtHA year-end awards, and many local show awards. In 1997, I completed my final year as a youth aboard Skip's Blueyed Dude.In addition to Pinto Horse of the Year titles and High Point Senior Youth Zone 7 titles, we earned many pinto year-end awards, both in New England and nationally, as well as several NEPtHA perpetual trophies and PtHA ROM's. I also earned the distinction of being named Miss NEPtHA 1998. I began my amateur career aboard Classys Diamond, owned by Kim Gonder. In the two years we were a team, we earned numerous PtHA ROM's and ROE's, both in the amateur and open division, a PtHA Legion of Merit, three Pinto Reserve National Championships in Tulsa OK, several national Horse of the year titles, and High Point Junior Amateur Zone 7 in 1998 & 1999. In NEPtHA, Classys Diamond earned the JAck Savioli Horse of the Year Award in 1998 and 1999, as well as many other perpetual trophies and year-end championships both years. Again, I was the NEPtHA queen in 1999. At the end of show season in 1999, I made the decision to give up my amateur career. Now, my passion is training and showing pinto horses. I especially love training versatility horses - the true all-around horse that can halter, ride english and western, jump, do dressage and have fun out on the trail. Since I have began my training career, both my clients and myself have been fortunate enough to have earned countless PtHA ROM's, as well as several PtHA Championships along with several PtHA Horse of the year titles and many horses ranked in the top ten for horse of the year standings.In NEPtHA, my training horses and clients have earned dozens of year-end championships in Open, Amateur, and Youth events, including halter, english, western, jumping and gymkhana. Several of our horses also placed in the top five at the Pinto World Championship show in 2003. In 2004, we had an incredible season. My training horses and clients earned many year-end championships and perpetual trophies. Bonanza Dot Com, owned by Patti & Rich Cole, earned many championships, along with the distinction of earning the Jack Savioli Horse of the Year award and Bold Sassaman Stallion of the Year trophy. My pony, Rabidash, also earned several championships and earned the Chipiqua Masterpiece Pony of the Year trophy, as well as the MrD Western Pony award.. Along with earning many championships, Megan Guilbault was named Miss NEPtHA 2005. Lesley Alexander and Zip It Good earned several championsips, as well as the Painted Brook Farm Youth Hunter Jumper Trophy, Hot Knight Tonight High point Hunter type trophy, and the Goggin Cup. Allicyn Cole, aboard Rabidash won her first year-end championship. Both Judy Swift & Dudes Majic Diamond and Kyle Alexander & Genuine Too Doo had a great year earning many year-end awards. Kyle also earned the NEPtHA annual Sportsmanship award. In 2005 at the Pinto World Championship Show in Tulsa, Rabidash and I showed to a unanimous Pony Trail World Championship. In addition, Kyle Alexander exhibited Rabidah to 2 Res. World Championships - Pony Disciplined Rail English and YA English Showmanship Pony/Mini.Rabidash and Bonanza Dot Com both earned quite a few Top Ten honors at the World Show. My program mainly focuses on preparing both horse and rider for the breed show ring. I create an individual program for each horse or horse/rider combination based upon the goals which they have established. My main focus is to help my clients establish these goals. So far, my clients have had great success earning countless National Awards including Supreme Champion, Versatilty Award, Legions of Merit, PtHA Championships, Certificates of Ability, Certificates of Achievement, ROE's & ROM's and national rankings in PtHA Horse of the year standings , as well as NEPtHA year-end awards and perpetual trophies, and have placed well at the Pinto World Championships in Tulsa, OK. I strive to meet the needs of each of my clients individually -whether it be the trails, local shows or the World show level. I'd like to thank all of my clients, both past and present. I look forward to another great season in 2007!! !